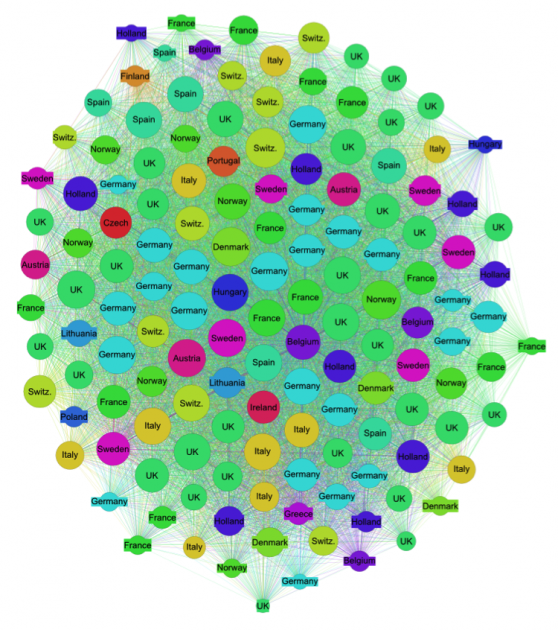 How connected are European climate think tanks? | Environmental Europe? Drawing on this dataset, I wanted to explore to what extent European climate think tanks share similar research interests. The ICCG database categorizes think tanks according to which of nine research fields they focus on: adaptation, sustainable cities, climate and development, carbon finance, forestry/land use, impacts, policy and institutions, renewable energy/efficiency, and water. There are currently 141 European think tanks listed in the database, and each organization is categorized as focusing on between two and six topics. The resulting network is extremely dense (see Figure 2 below). Almost 90% of the 140 organizations in the network share a research focus with at least 95% of their peers. Nearly half share a focus with every other organization. This finding can be summed up briefly: “Everyone is connected to (nearly) everyone else.” This is not surprising, given that popular research fields are a focus of a vast majority of the listed think tanks (e.g., the Policy & Institutions theme is a focus of 85% of organizations). However, not all connections are created equal. While many organizations share one or two research fields in common, only a few have five fields in common. Of the 9,487 edges in the network, 88 – or less than 1% – represent a connection between two organizations which share five research fields. What will happen if we look only at these strongest connections? By reducing our focus to the 59 ‘super-connected’ organizations which share five fields with at least one other think tank, we get the network shown in Figure 3. To illustrate what this graph is showing, I will first focus on the cluster in the upper right. This cluster includes SEI, the Tyndall Centre, SERI, BEF, and Ecologic. These organizations share five research themes in common: adaptation, climate and development, policy, renewable energy and efficiency, and water. Other clusters or sub-clusters have their own distinct set of shared research topics. In the center, the Switzerland-based World Wide Fund for Nature and the German Kiel Institute for the World Economy form the backbone of a larger cluster of organizations. It is important to note, however, that many of the think tanks on the edges of this cluster are not directly connected (e.g., Leibniz and IUCN). Without the IWE and WWF, this group would fragment. So how can these types of network data and visualizations be used inside and outside academia? 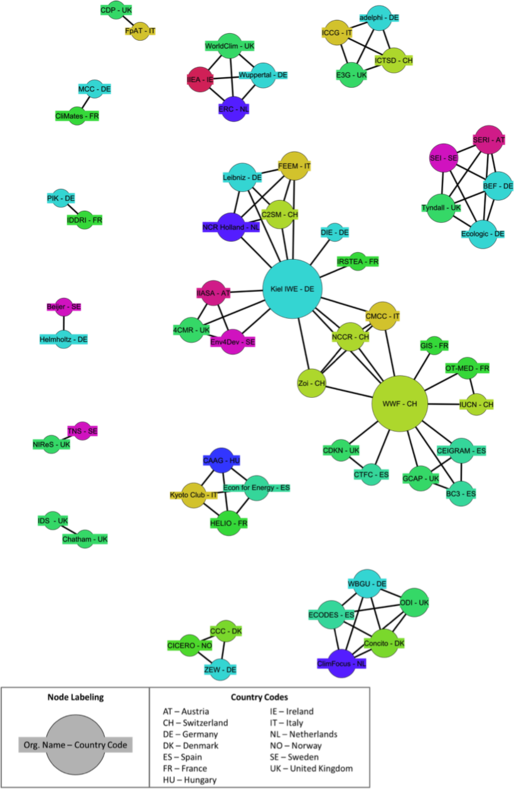 Within academia, visualizations such as these network maps are often seen as a way to communicate results after academic research is completed. However, Fox and Hendler argue that data visualization can also be used as an “exploration tool” during the research process to make sense of the “data deluge” that many academics must now confront. These think tank maps are two examples of this “exploration” approach, and could be combined with other research methods. For example, just because two think tanks share a common research theme does not mean their methods or general theoretical orientations are similar. Qualitative techniques, such as content analysis of websites, could be used to address this issue and create a thick description of a smaller subset of these organizations. Finally, network analysis is potentially useful for many stakeholders outside of academia. For example, journalists could use this data to find previously undiscovered patterns in the climate change think tank network, while members of the think tanks themselves could use network visualization to give them a clearer picture of which other organizations are researching similar topics. In the end, this type of social network data could be analyzed from many interesting angles and could add insights to climate change policy and practice. Note: This post’s underlying data and an acronym key are available here. Network data files (nodes, edges, GDF, Gephi) are available by request by sending an email to bpmoore[at]gmail.com. This is a work in progress, so feedback is greatly appreciated. This does not include the Centre for International Sustainable Development Law (CISDL), which is categorized as European but is based in Montreal, Canada. The total number of organizations used in this analysis is 140. One additional organization was added to the ICCG database during this analysis and was omitted. Brendan Moore is a PhD researcher at the University of East Anglia’s Tyndall Centre for Climate Research. His research focuses on the EU Emissions Trading System (EU ETS) and its political effects on European climate change policy. This entry was posted in Energy & Climate Change, Global & International, Media & Communications and tagged climate change, data visualisation, Gephi, mapping, methodology, network, think tank. Bookmark the permalink.